The plan this week was 0-3-7-3-0-7-14 actual was 0-0-7-0-0-14-7. I worked late Tuesday and traveled Thursday but got my medium and long runs in. I guess if you are going to miss two runs, it might as well be the two short ones. Besides the mileage, I had a couple mental toughness runs this week. 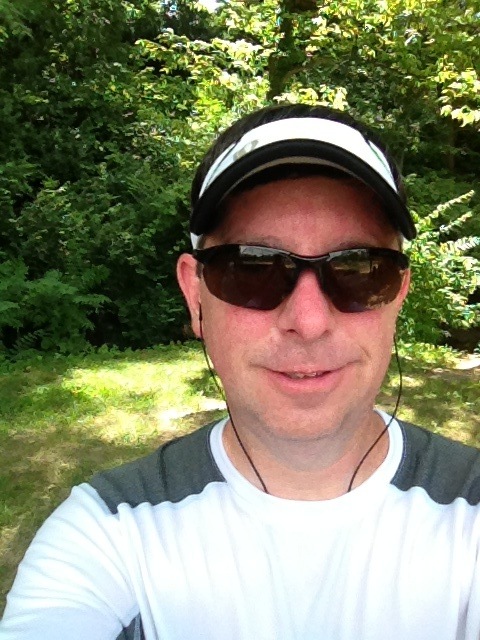 Wednesday I was in Solon Ohio (a suburb of Cleveland) at my remote office and set out for a run after work. The hourly weather forecast said 0 % chance of rain but there were rain showers popping up in the area. About 2 miles from the hotel, it started sprinkling which then turned into a moderate rain. No lightning and no SAG support so I kept going. A half mile later I turned around and started to head back playing the rationalization game in my head of "5 miles is close enough to 7". Then about 15 minutes later it stopped raining so I added 2 miles back on and hit the 7 on the plan. Saturday I set out for my 14 miler about 10 am and it was already in the mid 80's with humidity just over 70% putting the heat index around 90. By mile 3 I was pretty much drenched in sweat and by mile 6 I was a little dizzy and started the rationalization game again. This time i was working on convincing myself that if I did 11 and followed up with 11 more on Sunday it would be the same as the planned 14 and 7. When I got to my first water refill point at mile 8, I poured a bunch of water over my head and started to perk up a little. 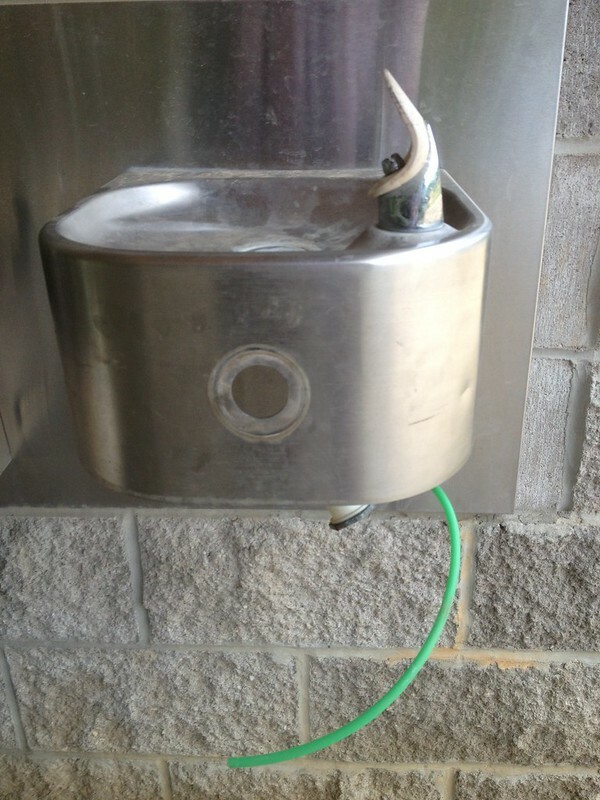 Luckily there is another fountain at this park. 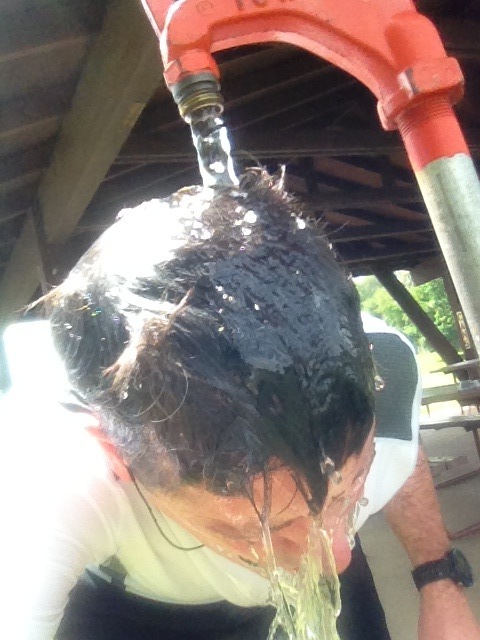 After cooling off, I figured I could make it the ~2 miles to the next park, do the water over the head trick. That felt so good. Now I was just past 10 miles and the heat index was in the upper 90's. Now I figured I could make it ~2 miles to the next water fountain and cool off again then make it home. Shortly before setting off on my last 4 miles, my wife showed up on her bike to bring me cold water! How awesome is that? I email her a link to Garmin Live Track before every run mostly so that if I die of a heart attack, she'll know where to send the meat wagon even if some animals drag me into the woods :-). Anyway, 14 miles in the books. The plan for Sunday was "just" 7 miles. It was a little cooler, but not much so I planned my route to end at the park with the cold water, then walk the 3/4 mile home to finish "cooling off". Broke out the visor for the first time this year. Anyway, week 5 is in the books. Week 6 is a slight cutback week. My friend Jill commented on my last post asking how training is going. The short answer is slow. Still trying the Maffetone thing and with all the variables, I can't really tell if it's working. The long answer will be a future post :-). Way to tough out those more difficult runs. If you stick with MAF you'll see results. Boo to the heat and humidity. But kudos to you for toughing it out. I already froze my water for yesterday's measly 10 miler. Heat wuss. I'm doing MAF for this training cycle too. Jury is still out on if it is working or not, but it takes time. How awesome of your wife to bring you cold water! That's fantastic that your wife brought you water! Your training is looking awfully good. Those hot runs are miserable, but just think how tough you'll be in the fall when (hopefully!) the weather is cooler. Heat does me in. You seem to be doing well with your training. Any tris?